Infrastructure as Code vs RESTful APIs ...Terraform and Everything in Between! - VIRTUALIZATION IS LIFE! Infrastructure as Code vs RESTful APIs …Terraform and Everything in Between! 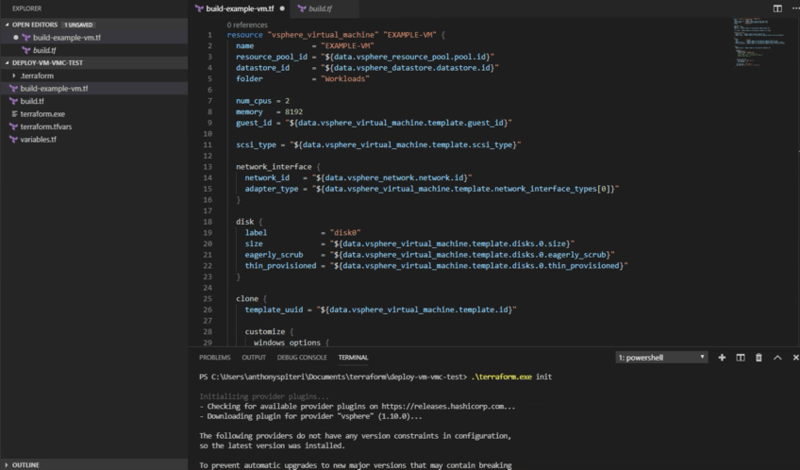 While I was a little late to the game in understanding the power of Infrastructure as Code, I’ve spent a lot of the last twelve months working with Terraform specifically to help deploy and manage various types of my lab and cloud based infrastructure. Appreciating how IaC can fundamentally change the way in which you deploy and configure infrastructure, workloads and applications is not an easy thing to grasp…there can be a steep learning curve and lots of tools to choose from. Infrastructure as code (IaC) is the process of managing and provisioning computer data centers through machine-readable definition files, rather than physical hardware configuration or interactive configuration tools. The IT infrastructure managed by this comprises both physical equipment such as bare-metal servers as well as virtual machines and associated configuration resources. The definitions may be in a version control system. It can use either scripts or declarative definitions, rather than manual processes, but the term is more often used to promote declarative approaches. The statement above is fairly controversial… especially for those that have been preaching about IT professionals having to code in order to remain viable. A lot of that mindshare is centred around the API and the DevOps world…but not everyone needs to be a DevOp! IT is all about trying to solve problems and achieve outcomes… it doesn’t matter how you solve it… as long as the problem/outcome is solved/attained. Being as efficient as possible is also important when achieving that outcome. My background prior to working with IaC tools like Terraform was working with and actioning outcomes directly against RESTFul APIs. I spent a lot of time specifically with vCloud Director and NSX APIs in order to help productise services in my last two roles so I feel like I know my way around a cURL command or Postman window. Let me point out that there is nothing wrong with having knowledge of APIs and that it is important for IT Professionals to understand the fundamentals of APIs and how they are accessed and used for programatic management of infrastructure and for creating applications. I’m also not understating the skill that is involved in being able to understand and manipulate APIs directly and also being able to take those resources and create automated provisioning or actual applications that interact directly with APIs and create an outcome of their own. Remembering though that everyones skill set and level is different, and no one should feel any less an IT practitioner if they can’t code at a perceived higher level. In my VMUG UserCon session last month in Melbourne and Sydney I went through the Veeam SDDC Deployment Toolkit that was built with various IaC tooling (Terraform and Chef) as well as PowerShell, PowerCLI and some Bash Scripting. Ultimately putting all that together got us to a point where we could declaratively deploy a fully configured Veeam Backup & Replication server and fully configure it ready for action on any vSphere platform. That aside, the other main point of the session was taking the audience through a very quick Terraform 101 introduction and demo. In both cities, I asked the crowd how much time they spent working with APIs to do “stuff” on their infrastructure… in both cities there was almost no one that raised their hands. After I went through the basic Terraform demo where I provisioned and then modified a VM from scratch I asked the audience if something like this would help them in their day to day roles… in both cities almost everyone put their hands up. Therein lies the power of IaC tools like Terraform. I described it to the audience as a way to code without having to know the APIs directly. Terraform Providers act as the middle man or interpreter between yourself and the infrastructure endpoints. Consider it a black box that does the complicated lifting for you… this is the essence of Infrastructure as Code! There are some that may disagree with me (and that’s fine) but I believe that for the majority of IT professionals that haven’t gotten around yet into transitioning away from “traditional” infrastructure management, configuration and deployment, that looking at a IaC tools like Terraform can help you not only survive…but also thrive!